Many iPhone and iPad users know that Siri has a huge range of capabilities surrounding specific actions, but fewer know that Siri can also serve more obscure functions, like generating a random number for you. 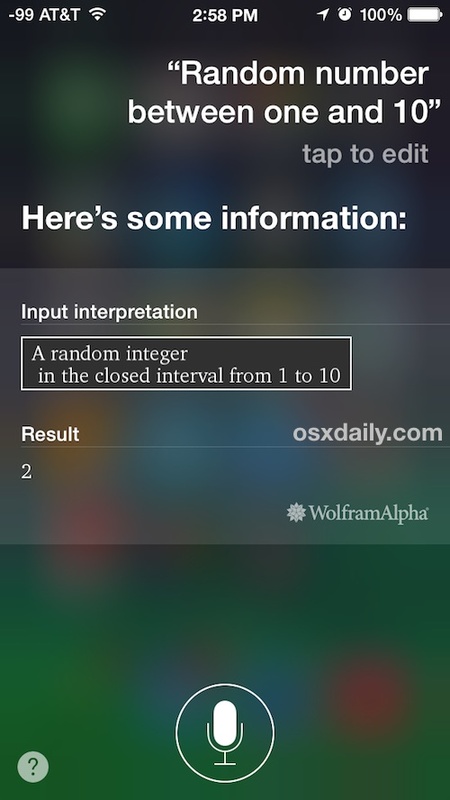 This is handled through Siri’s data connection through Wolfram Alpha, and it’s effective at truly randomizing integers similar to the virtual assistants ability to create a random password. So, the next time you need a random number for any particular purpose, pull out your iOS device and summon Siri to ask for such a thing. Siri will report back what was found with a result numerical value, as well as the spelled out number, and the number plotted on a number line. You can also try “random integer” or a more direct command like “Give me a random number”, but curiously, while it usually works to dish out a randomized digit, every once in a while Siri will say the latter option is not within their command abilities, thus we’ll keep it simple. 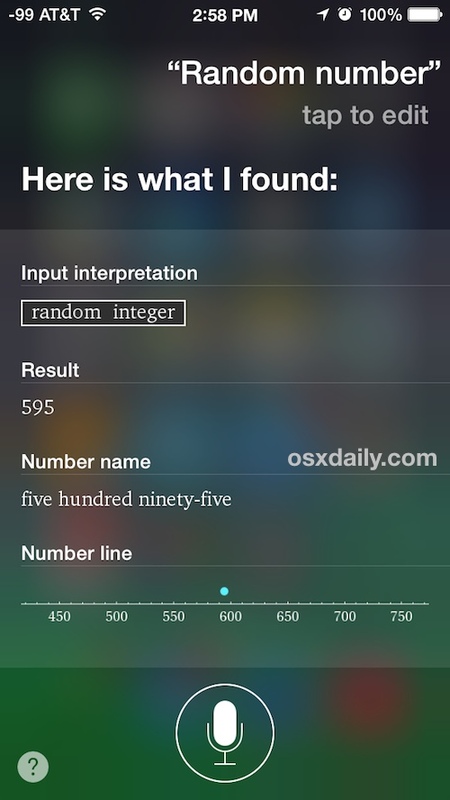 Having Siri randomize a prime number will also include much more detail about the number chosen, including factorization, whether it’s odd or even, and whether it’s regular or irregular. For random ranged numbers created, Siri will forfeit the value, spelling, and there won’t be a number shown on a line. If you’re aiming to use this for security purposes you may want to consider having Siri generate specified character counts and blocks instead by asking to create a randomized password string of alphanumerics, since that is typically more secure than a simple numerical string. Additionally, users are unable to request a specific number of digits to ask for the random number, while the random password can be limited by a character specification. There are plenty of potential uses for this, or it can just be fun to help settle a decision or debate similar to how Siri will flip a digital coin and roll dice for you as requested. This headline immediately attracted me…. but like so many things with Siri…. it only proves yet another let down…. without fully reading your article, I picked up the 5 and fashioned this question, which Siri ‘heard’ perfectly…. “Siri can you generate a random password please”….. and her answer came back…. “I’m not sure if I’m able to do that or not, but I’m always learning new things.”….. totally useless…. Right, how you ask Siri to do things has to be very specific. In this case, “random number” works where as saying that phrase will not. This is one of the ways that Google Now is much ‘smarter’ than Siri. As a side comment, you can tell siri to roll dice and it will report 2 numbers (1-6) for you. Me: Random number greater than 1000. Siri: 927. When I say “Random one to 20”, it looks of a movie. When I say “Random one to 20” it looks for a place.